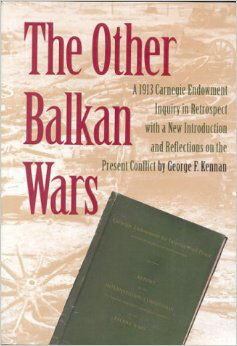 In 1993, against the background of the atrocities of the new Balkan wars, the Endowment reissued its original 1913 report with a new introduction by George Kennan. In 1913, the young Carnegie Endowment for International Peace established a seven-member commission to investigate the 1912 and 1913 wars in the Balkans. The horrifying and gruesome information collected, and the pessimistic conclusions reached, were originally published by the Endowment in the early summer of 1914—and were quickly overshadowed by the beginning of the first World War. In 1993, against the background of the tragedies and atrocities of the new Balkan wars, the Endowment reissued the report with a new introduction by George Kennan.